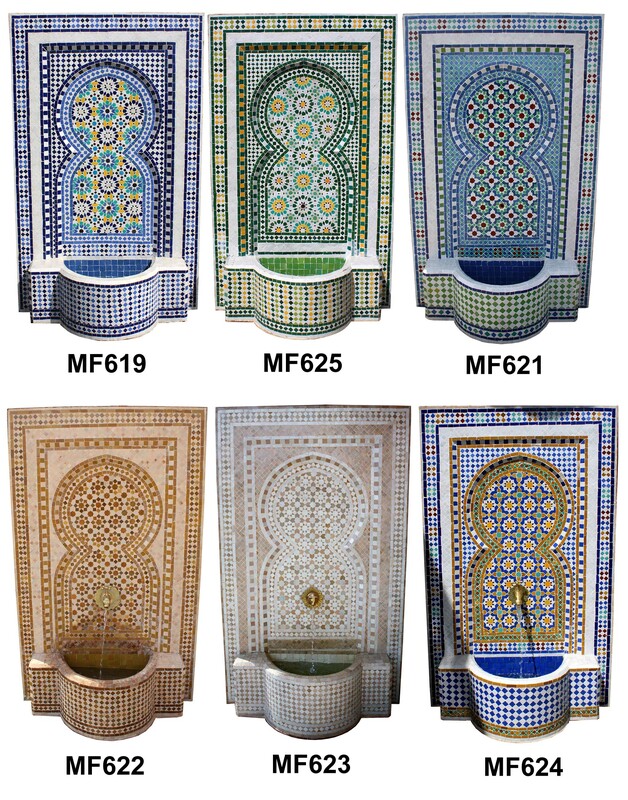 Many of our Moroccan Tile Water Fountains are marked down to a lower price for a limited time. You can find many of our Moroccan Water Fountains on our Badia Design Inc website. Check out our new Moroccan Mosaic Wall Fountains. They feature a waterfall brass sprout, water pump and hose, which is perfect for indoor or outdoor use. They are made with quality in mind and built to last for a very long time. We carry a huge selection of colorful Moroccan wall fountains that I’m sure you and your guests will fall in love with. We also custom make many designs, patterns and sizes of Moroccan style wall fountains to meet your needs. Contact us at info@badiadsign.com for more information and pricing. Visit http://www.badiadesign.com for more information and ordering. Mosaic Tile Arched Top Wall Fountain 24″ W x 10″ D x 43″ H. It comes with a Brass Spout, perfect for indoor and outdoor. We can custom made the color and size for your needs! Contact us at info@badiadesign.com for more information.